This is another variation of clafoutis, the pastry-less Limousin tart and I will be posting a savoury version shortly but I wanted this recipe to introduce the fabulous foraging season. September seems to have ushered in a bumper crop of wild fruit, which is timely, as the apple harvest, here at least, doesn't auger well. If, like us, you are buying a percentage of your organic foodstuffs, then it can be both profitable and enjoyable to find some additional provisions for free. The good news is that this time of year, if you are living in the Northern hemisphere, you are coming up to the optimum time for foraging. 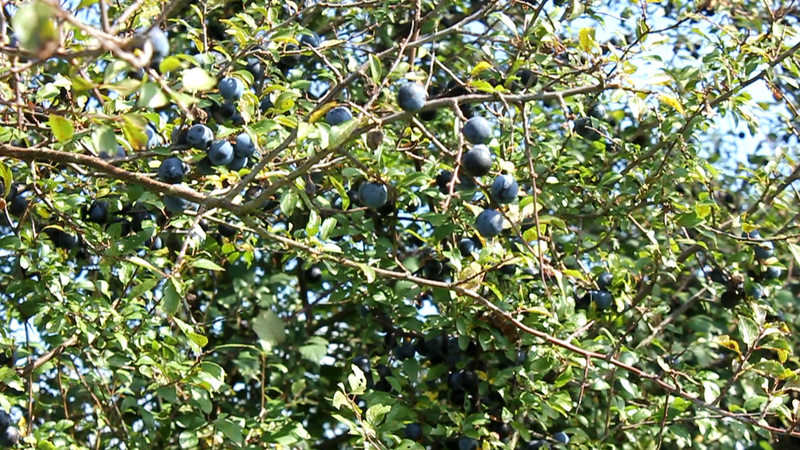 The hedge rows are literally laden down with fruit and we have never seen such a year for sloes and they are also quite unusually sweet, we ate a lot as we were foraging! Of course you can forage in your own garden, for rose hips, nuts and berries if you have hedges but you can also go out into the fields and meadows. 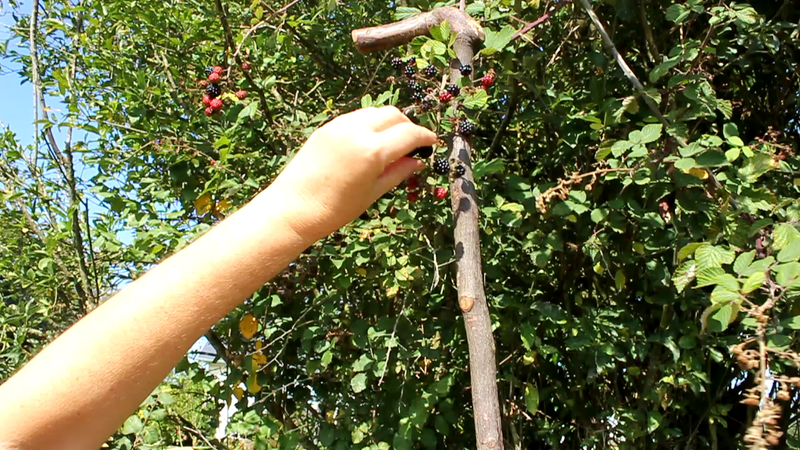 Remember to take a walking stick with which to gently pull down the fruit, without damage to the hedge or individual plant. 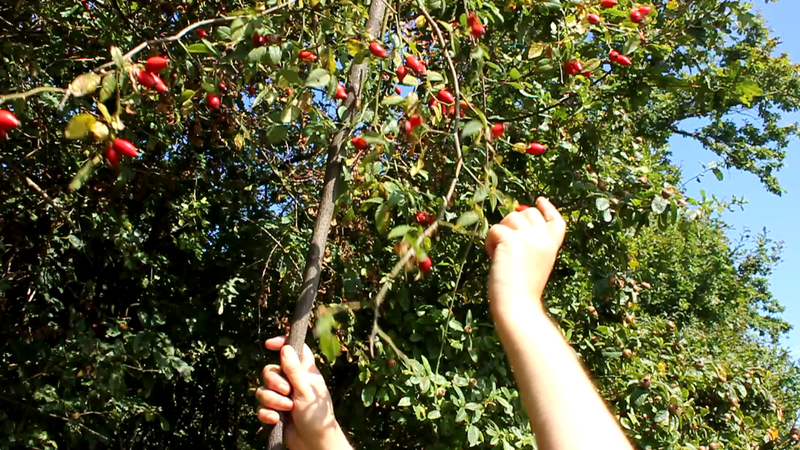 It's good idea is to contact your local organic farm and ask about wild fruits on their farm land. In general though, horse paddocks, pasture land, parks, canal tow paths and common land, far away from spray drift from conventional crops, make for good foraging. Below is one of our favourite paths, on the cliffs along our local coast line, too dry this year, we did better in local meadows but it was a wonderful excuse for a walk all the same. As we really enjoyed the gluten-free version of my plum clafoutis I made a few weeks back (recipe here) , I decided to go with the same mix again. I did however, omit the coconut oil, by mistake but I don't think it needed it as the mixture of fruits carried the rich flavours on their own. Optional - raw cane for sprinkling on the fruit. Cut the rose hips in half and using a teaspoon remove the hairy seeds from the interior. These are the rose's defence system to stop birds and mammals from absorbing the seeds once consumed! The hairs are actually quite aggressive I found I needed to rinse my fingers well, after this operation. I then precooked the rose hips for a few minutes in a little water just to soften them slightly as they were much harder than the remainder of the fruit. Butter your pie dish generously and place upon it, cut face downwards, the whole black berries or halves of rose hips and sloes with the stone removed. Use enough fruit to cover the base, I'm using a 22cm or 8½" circular dish with an internal depth of 30mm or 1". I sprinkled the fruit with a little raw cane sugar, not rapadura as I thought this would be too strong a flavour. 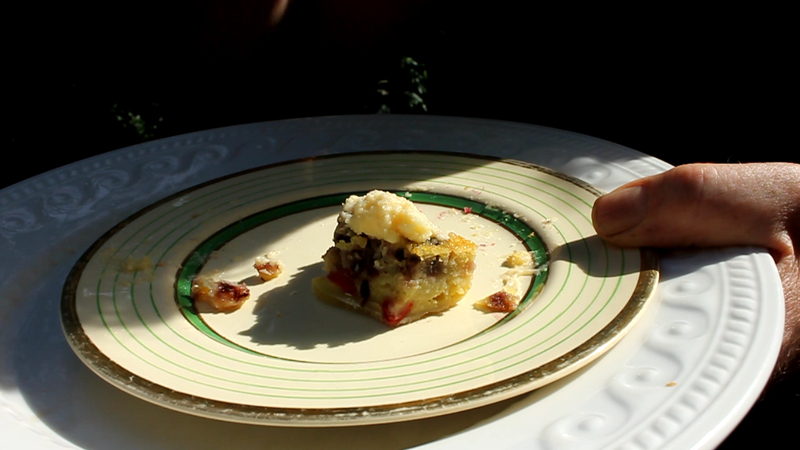 The clafoutis can then be sprinkled with the remaining sugar just to give it a little crunch and extra texture. You can eat it straight from the oven, but I usually have some left over for the next day. I found this one developed in flavour overnight, although we didn't actually have much left over! Hope you enjoy this dish, again it is simple and yet delicious and the free foraged fruits, as my grandpa used to say; 'don't taste of the copper', though nowadays it's probably nickel! Sounds yummy. I will give it a go. A bit late for blackberries but maybe I can use other seasonal fruit.